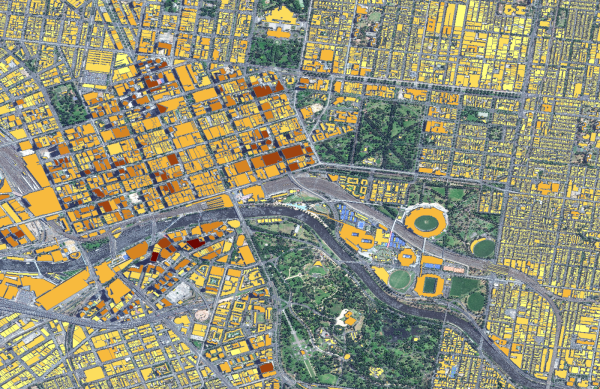 In a world-first, a data company has mapped every single building larger than nine square metres in Australia. The Geoscape data set, collated by PSMA Australia, showed there were 15,243,669 buildings in the country. PSMA said it was the first time a continent had had its entire surface scoured to find not only the number of structures, but also other types of land coverings, such as trees. Chief executive Dan Paull said collecting all the information in one place was his company’s crowning achievement. He said it offered a complete and comprehensive view of the country’s built environment. “The information provided is already available to anyone who walked down the street,” said Mr Paull. “[But] the information has not been brought together previously. Victoria has the tallest building (the Eureka tower), and the largest. Melbourne Airport is biggest building by size in the country. The state is a third of the area of NSW – it has 275,612 fewer structures – but it was the most dense state.